After you connect your store to Mailchimp, you may want to use our Order Notifications automation to send customizable transactional emails, like refund or shipping confirmations, that match the style of your brand. If you use Shopify, there are a few extra steps you'll need to take to make sure your customers don't receive duplicate messages. In this article, you'll learn about Mailchimp's order notifications, and what to do after you enable them. This is a multi-step process that takes place in your Mailchimp account and in Shopify. To complete the setup, you'll need to create an Order Notification automation in Mailchimp, then make sure not to send corresponding notifications in Shopify and elsewhere. Shopify uses the term "order notifications" to refer to emails that go to a store owner when one of their customers buys something. In Mailchimp, however, order notifications are automated transactional emails that we send to the customers of your connected store. This automation offers design control over five types of notifications: Order Confirmation, Order Invoice, Shipping Confirmation, Refund Confirmation, and Cancellation Confirmation. Each type is triggered by corresponding activity in your online store. To learn how to add this automation, read Add Order Notifications. After you enable order notifications in Mailchimp, it's important to make sure you stop sending order emails from Shopify and other vendors, so that your customers don't receive duplicate messages. While it's not possible to disable all email notifications at once in Shopify, in most cases, you can choose not to send them when you take action on an order. For example, you'll turn off order shipment notifications while you fulfill orders in Shopify. Here's a rundown of order notifications in Mailchimp, and what steps to take in Shopify after you enable each one. Shopify always sends your customers an order confirmation email after they make a purchase. These emails cannot be disabled. To avoid sending duplicate messages to your customers, we recommend you choose not to enable the Order Confirmation notification in Mailchimp. If you have any questions about order confirmations in Shopify, contact Shopify support. Mailchimp's Order Invoice notifications tell your customers when their payment has been processed. Shopify doesn't send this type of email to store customers, but it often comes from outside payment processors. If you use a payment processor outside of Shopify, like PayPal, review its settings to confirm it isn't sending any emails that might duplicate our Order Invoice. If you can't disable notification emails from your payment processor, or you don't want to, we recommend you leave the Order Invoice disabled in Mailchimp. When you first create an Order Notifications automation in Mailchimp, we enable the Shipping Confirmation email by default. You'll need to disable the Shopify shipping confirmation, which can be done on an order-by-order basis, or in bulk. To fulfill a single order without sending a shipping confirmation from Shopify, uncheck the box next to Email shipment details to the customer now. To fulfill multiple orders without sending any Shopify shipping confirmations, follow these steps. In the left navigation menu, click Orders. Check the box next to all of the orders you want to work with that are marked Unfulfilled. 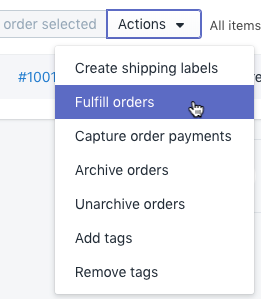 Click Bulk actions and choose Fulfill orders. Uncheck the box next to Send a notification to the customer, and click Fulfill. After you enable Mailchimp's refund or cancellation notifications, you'll need to turn off similar notifications in Shopify on an order-by-order basis. To issue a refund or cancel an order without sending a notification email from Shopify, uncheck the box next to Send a notification to the customer. Use our automation feature to send order notifications like receipts, shipping confirmations, and more. Promote the items e-commerce customers are most likely to buy with Mailchimp's product recommendation. Learn how to set up this feature and how it works.